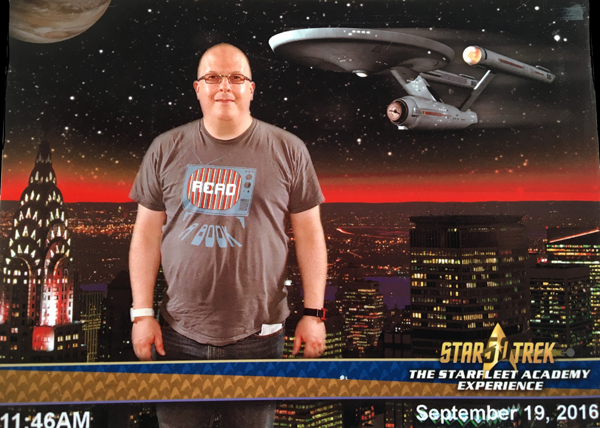 September 8 marked the 50th anniversary of Star Trek’s premiere on NBC back in 1966. There’ve been any number of celebrations on TV, online and around the country. 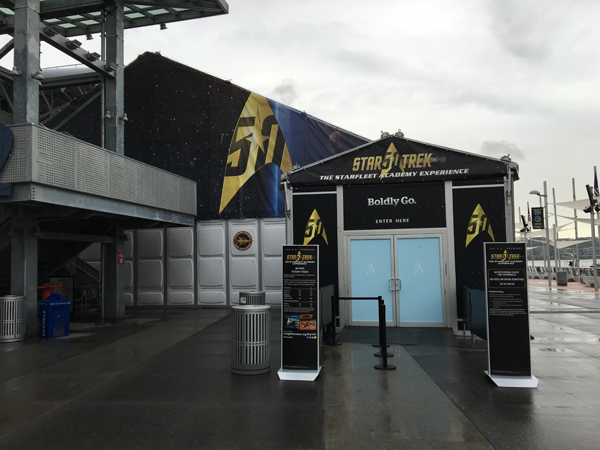 Back in July, the Intrepid Sea Air & Space Museum in NYC became home to the Starfleet Academy Experience. Since I knew I was going to be in the city after the Cycle for the Cause ride, I got a ticket to attend. The exhibit was packed with interactivity. As you come in, you receive a wristband that tracks what you do. There are several quizzes designed to see what you should specialize in—command, engineer, medical, communications, etc.—as an Academy cadet. Some specialities also have exercises you can do, such as diagnosing a Klingon in sick bay or selecting a suitable planet to land on. Throughout the exhibit there are dozens of costumes, spanning the various TV series, as well as props. It was great to see, for example, how phasers, communicators and tricorders changed over the years. Missing was representation from the movies, with the exception of some props. For example, no costumes were present from any of the films–from The Motion Picture through this year’s Beyond. 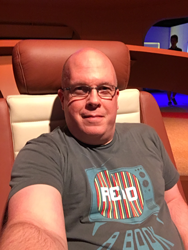 Also no sneak peeks of anything from the new Trek series coming in 2017. 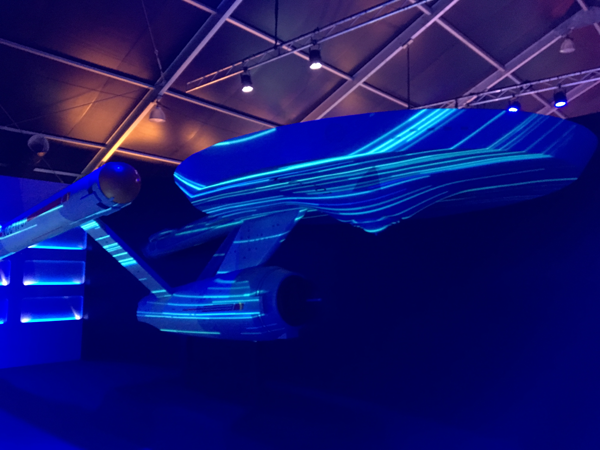 The two centerpieces of the exhibit were a model of the original Enterprise, which was used as a display for projections from the series. 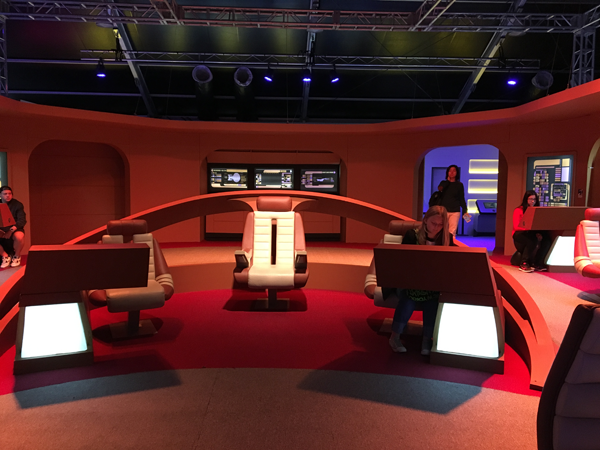 There was also a replica of the Next Generation Enterprise bridge, which featured station where you could take the Kobashi Maru test (sadly there seemed to be no way to cheat in this version. Touring the experience was a great way to spend a rainy Monday morning in Manhattan. It continues at the Intrepid through October 31, 2016. You can see all my images from the exhibit on Flickr.